Scinomix is an American company that develops automated tube labeling systems for customers in the life science industry. The automated systems have the ability to cherry pick, (de)cap, fill, scan, and label storage tubes. It is possible to create customized solutions for labs. 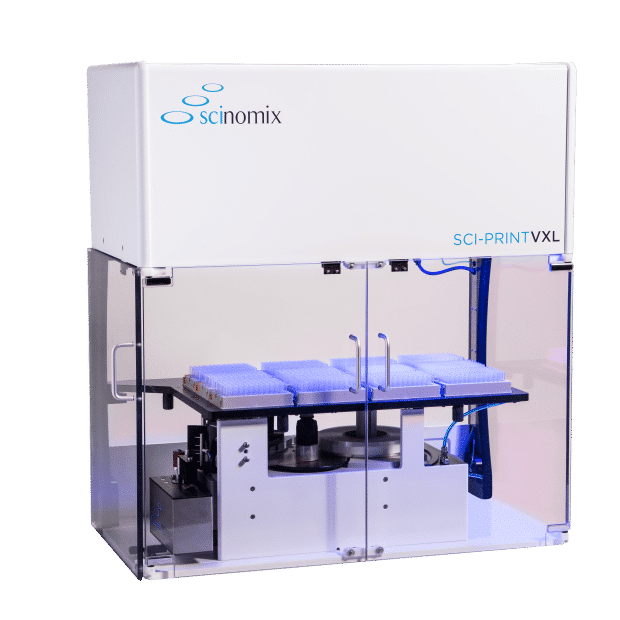 Scinomix offers a range of automated tube labeling equipment that helps prevent sample contamination, ensure accurate test results, and facilitate the workflow in your lab. From solo tube/vial labeling systems to barcode printers, Scinomix’s range of tube labeling equipment can be integrated into larger, automated systems or function as stand-alone units, depending on your laboratory needs. With the ability to fill, cherry pick, and label storage tubes, deepwell blocks, microplates, and vials, Scinomix tube labelers can eliminate human error from manually labeling tubes, thus increasing walk-away time and enhancing lab productivity.